Play video What happened at Hillsborough? This marks the end of the BBC's live coverage of the conclusion of the Hillsborough inquests. Please go to the BBC News homepage for the latest developments in the story, comprehensive analysis, and full reaction. Video caption: Who were the 96 football fans fatally injured at Hillsborough?Who were the 96 football fans fatally injured at Hillsborough? Ex-Liverpool player and coach Phil Thompson adds his voice to the chorus of former Reds' stars. Liverpool’s church leaders have said the journey for justice continues. The Rt Rev Paul Bayes, Anglican Bishop of Liverpool said: "The families have always said that they seek truth and justice, and the inquests have worked longer than any in British legal history to uncover the truth. Now justice must follow. BBC Radio Merseyside follows the families of the 96 through the two years of the Hillsborough inquests, narrated by survivor Neil Fitzmaurice. The coroner at the Hillsborough Inquests has praised the families of the 96 who died as a result of the tragedy. Coroner Sir John Goldring said the families "had done your duty" by their loved ones. Coroner Sir John Goldring closed the inquests by telling the jury that sitting "for this length of time in such a demanding and at times deeply moving case is to perform a public service of the highest order". He said he hopes the families "will now have gained some comfort". "I will ask... for the last time for us all to stand... and I will adjourn finally. Members of the jury thank you once again". 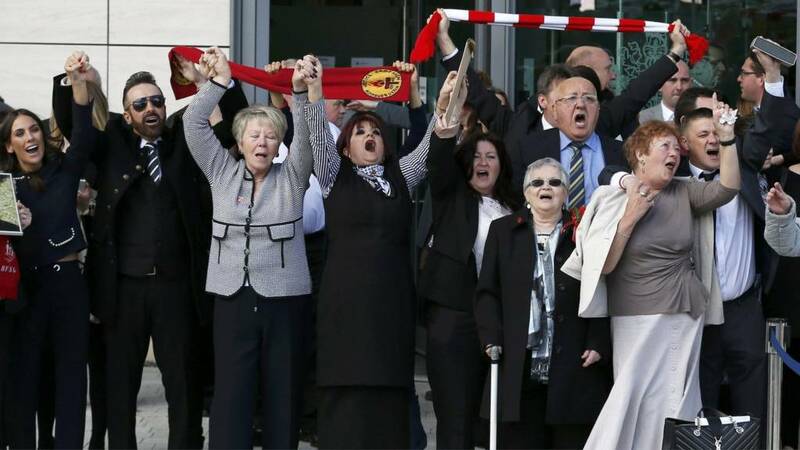 Liverpool FC welcomed the jury's decision, saying its conclusions confirmed "what the families always believed – their loved ones were unlawfully killed." A statement from Ian Ayre (pictured), the club's chief executive said: "We will always remember the selfless bravery and heroism of the many fans that helped their fellow supporters in the most harrowing of circumstances that day. "We praise those who, since the beginning of the inquest, have had to find the courage and strength to re-live what they went through." He said the solidarity shown by fans "encapsulates the unique character of both the club and city", adding that the club was "hugely thankful for the unwavering support the wider football community has so generously shown these past 27 years". A barrister for some of the Hillsborough families has said the inquests' conclusions have "reinforced the value of the jury system". Mike Mansfield said the inquests were "remarkable and historic", adding "the families were hoping for an unlawful killing conclusion but you just don't know". Mr Mansfield criticised the "ambivalent" attitude of the South Yorkshire Police which had apologised before the inquests but in court had sought to blame the fans when "we thought that had been put to bed by the Hillsborough Independent Panel". The current head of Yorkshire ambulance service said he is "truly sorry" for what happened at Hillsborough and admits lives could have been saved if the ambulance service's response had been different. Rod Barnes said the service fully accepted the jury's conclusions and extended his "deepest sympathy" to the bereaved families. He said "a huge amount has been learned from Hillsborough" and the service has "changed a great deal in the last 27 years". St John Ambulance chief executive Sue Killen said her organisation's volunteers "acted as best they could under extremely difficult circumstances" and their experience "will stay with our organisation forever". "Our thoughts are with everyone who has been affected by what happened on that day... It's clear from the testimonies that our volunteers acted as best they could under extremely difficult circumstances, and we are grateful to them for all they did," she said. David Whitmore, an expert in pre-hospital care, had told the inquests that while the South Yorkshire Metropolitan Ambulance Service response was delayed, volunteers from St John Ambulance "behaved better" than their counterparts by starting to help victims immediately. Julie Craven, who was 16 when she attended the Liverpool v Nottingham Forest FA Cup Semi-Final in 1989, recalls the crush in the Leppings Lane terrace. There will be a special event on Wednesday to commemorate the conclusion of the inquests. It will be held on St George's Plateau, opposite Lime Street railway station, from 17:45. The BBC's Inside Out North West team followed the family of the late Hillsborough campaigner Anne Williams throughout the two year inquests. You can watch it on the BBC News Channel at 20:00. If you're in the North West of England you can also see it on BBC One at 22:45. Inquests into the 96 football fans who died in the 1989 Hillsborough disaster have concluded they were unlawfully killed, with the jury finding match commander - former Ch Supt David Duckenfield - "responsible for manslaughter by gross negligence" due to a breach of his duty of care. Mr Duckenfield (pictured below in 1989) said in the pressure of the day he froze and did not consider the consequences of his actions. "I think it's fair to say that it is arguably one of the biggest regrets of my life, that I did not foresee where fans would go when they came in through the gates," he said. He also admitted to a "terrible lie". "Everybody knew the truth, the fans and police knew the truth that we'd opened the gates," he said. When asked if his "negligence" caused the disaster he told the inquest: "I wouldn't use the word negligence sir. Mistake. Oversight... I did my very best on the day." Read more about his role on the day, here. Campaigner Margaret Aspinall, whose 18-year-old son James was one of the 96 victims, said: "Everything was against us. The only people that weren't against us was our own city."